Not so much a band, per se, as a musical force of nature. They are a volcanic eruption of amazing sonic and rhythmic fantasmagoria. An eclectic instrumental menagerie that blends a wide range of genres into one unforgettable sound. 7. Goodness Gracious! Highly Contagious! Emperor Norton's Stationary Marching Band combines the rich musical history of the circus and the vagabond peoples of Europe with the raw energy of avant-garde jazz, the burning heat of funk and the irreverence and fun of today's Vaudeville for a sound that is somehow familiar yet like no other. Label them anyway you like! 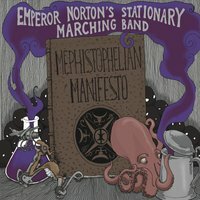 Circus Punk, Instrumental Noise, Balkan Fusion, Prog Brass, Heavy Funk, Experimental Big Band. They may be tough to sum up, but it’s easy to tell you they’ll show you a good time and they'll get a crowd dancing! ENSMB has performed at events ranging from HONK! Fest (in Somerville MA, Seattle WA and Austin TX), Outside the Box Festival, Boston Summer Arts Weekend, Salem Jazz & Soul Festival, and the Steampunk World’s Fair. They've performed with a wide variety of bands, such as Balkan Beat Box, Soul Rebels Brass Band and World/Inferno Friendship Society. They often can be found collaborating with the Boston Circus Guild, as well as frequently sharing bills with a talented network of bands from the robust Boston music scene. In addition to festivals and unorthodox appearances, the band can also be found performing at venues all across the Boston area, including The Sinclair, The Paradise, Brighton Music Hall, Johnny D’s, OBERON, The Middle East, TT the Bear's, Church, Lizard Lounge and Club Passim, as well as performing at Steampunk events all over the Northeast.